The IBM 4891 Infoprint 1145 MFP is an up to 45 page per minute for letter media(1) duplex, networked monochrome multifunction printer with an intuitive touch-screen interface that provides easy access to fast, reliable print, copy, fax, and scan to e-mail/network capabilities. Advanced authentication with secure corporate directory browsing provides safe and controlled access to the device. Secure document printing is enabled through the use of PIN codes to ensure confidentiality. The IBM 4891 Infoprint 1145 MFP Model 001 is an up to 45 page per minute for letter media duplex, networked monochrome multifunction printer for North America with a standard input capacity of 3,535 sheets, first page out time as fast as 4 seconds, 64 MB of standard memory soldered on the controller board, support for up to a maximum of 384 MB of memory, USB connection, 10/100 BaseT Ethernet, 600 x 600 dots per inch (dpi) resolution, 35-sheet auxiliary tray, three 500-sheet drawers, two 1,000-sheet drawers, and language support. Flexible connectivity options including standard Fast Ethernet 10/100 BaseTX and USB interfaces as well as optional Token-Ring, twinax/coax, and serial/parallel interfaces. The toner cartridge for the Infoprint 1145 MFP is not compatible with the Infoprint 1145. The 1145 MFP supports a wide range of standard print data streams, including Postscript 3 Emulation, PDF 1.2 & 1.3, and PCL6 Emulation. Many customers further leverage the 1145 MFP by adding optional Intelligent Printer Data Stream (IPDS) support. Most popular networking connectivity options are available, including standard Fast Ethernet 10/100 BaseTX and USB interfaces as well as optional Token-Ring, twinax/coax, and serial/parallel interfaces. With a standard input capacity of 3,535 sheets (20 lb or 75 gsm bond) and first page out time as fast as 4 seconds, the 1145 MFP is an excellent solution for large workgroups. If complex finishing is required, the 1145 MFP supports finishing options that can staple in multiple positions, offset jog output for easy retrieval, and hole punch in a variety of locations. 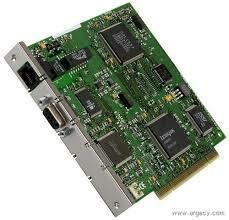 The Infoprint 1145 MFP (M35) controller has a 350 MHz processor. The printer comes with 64 MB of standard memory soldered on the controller board. It supports a maximum of 384 MB of memory (total of soldered memory and two memory slots). A maximum of 32 MB of optional flash memory is supported using the one flash memory slot. An optional hard disk is available. The Infoprint 1145 MFP has a USB connection and 10/100 BaseT Ethernet as standard. Up to 50% toner savings can be realized depending on toner darkness setting. The printer comes standard with a 35-sheet auxiliary tray, three 500-sheet drawers, two 1,000-sheet drawers, and duplex capability as standard. Standard input capacity is 3,535 sheets and output capacity is 500 sheets. The printer has the following media handling options: envelope feeder and 3K finisher. The maximum monthly print usage is 250,000 impressions. IBM does not recommend printing to this monthly maximum on a consistent basis. The maximum monthly scan usage is 10,000 scanned pages. IBM does not recommend scanning to this monthly maximum on a consistent basis. This product may connect to a Public Telecommunication Network. Country regulations and laws may require Telecommunication Approval through the country Telecommunication Authority prior to sale. Model Print Speed Input Capacity Memory Std./Max. Resolution Misc. Speeds are for 300, 600, and 1200IQ dpi using plain paper setting. Actual speed will vary with other media type settings. Note: FPOT is defined as the time when the print engine receives the Start Command from the printer controller to when the trailing edge of the first sheet exits the printer's exit feed rollers into the output bin. All measurements are with letter size paper, Long Edge Feed (LEF), ready mode. The Infoprint 1145 MFP printable area is limited to within 4.0 mm (0.16 in.) of top, bottom, left, and right edges of the media. Any information placed outside this specified printable area will not print. 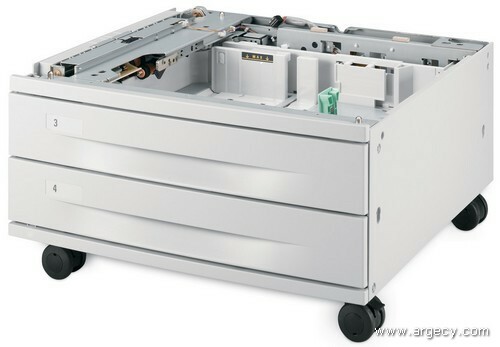 All models come standard with three 500 sheet paper drawers, two 1,000 sheet paper drawers and one 35 sheet auxiliary tray. One 500 sheet output bin is standard. See tables below for standard and maximum media capacities. Note: (2) 245 mm maximum width, 216 mm maximum length. Note: (3) 76 x 76 mm minimum size, 297 x 432 mm maximum size. All media must be able to withstand 200 deg C (392 deg F) fusing temperature. Preprinted forms and letterheads should be selected using guidelines found in the printer User's Guide. The chemical process used in preprinting may render some papers unsuitable for use with the Infoprint 1145 MFP. Recycled paper less than 80gsm may cause unacceptable results. Transparencies specifically designed for xerographic copy machines or laser printers may be used with the Infoprint 1145 MFP. 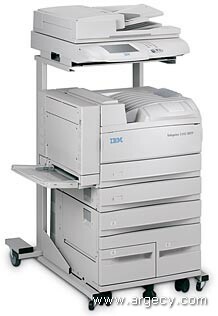 The Infoprint 1145 MFP complies with the global standard for Information Technology Equipment, i.e. IEC 60950, and its country equivalents in the markets we serve. The following sections highlight the approvals and certifications that the Infoprint 1145 MFP is expected to receive. Pending - Official Mexican State Agency approval & import registration to equipment standard NOM-019-SCFI-1993 Safety of Data Processing Equipment, and NOM 151 Provisional Telecom Approval. Industry Canada Telephony Requirement SC03. CB Certificate and Test Report to read as follows: A sample of the product was tested and found to be in conformity with IEC 60950 Edition 3; National Deviations AT, AU, BE, CH, CN, CZ, DE, DK, EN, FI, FR, GB, GR, HU, IE, IL, IS, IT, KR, NL, NO, PL, RU, SE, SI, SG, SK, UA, YU and ZA. IEC 60825 shall be included for laser products. Israel and Poland Telecommunications Type Approval for Analog PSTN equipment. The Infoprint 1145 MFP printer complies with the global standard for Information Technology Equipment, i.e. IEC 60950, and its country equivalents in the markets we serve. The following sections highlight the approvals and certifications that the Infoprint 1145 MFP printers are expected to receive. International Electrotechnical Commission IEC 60950 2nd Edition, plus Amendments 1, 2, 3, 4. CB Certificate and Test Report to read as follows: A sample of the product was tested and found to be in conformity with IEC 60950 Edition 2, with amendments 1 (1992), 2 (1993) 3 (1995), and 4 (1996); National Deviations AT, AU, BE, CH, CN, CZ, DE, DK, EN, FI, FR, GB, GR, HU, IE, IL, IS, IT, KR, NL, NO, PL, RU, SE, SI, SG, SK, UA, YU and ZA. (IEC 60825-1 Laser Safety Report shall be included). The Infoprint 1145 MFP comes standard with the ImageQuick Card pre-installed and the ImageQuick CD included. The ImageQuick Card must be removed to install the IPDS Card. The Card for IPDS and SCS/TNe provides AFP/IPDS and SCS(LU1) data stream support with Infoprint 1145 MFPs for IBM mainframe, iSeries and AS/400 computers. The Card for IPDS and SCS/TNe allows customers to print AFP/IPDS or SCS documents over TCP/IP to LAN printers. Number Pad: 1 through 0; "*"; "#"
Select automatic "send to self"
Note: Temporary profiles are deleted after use. 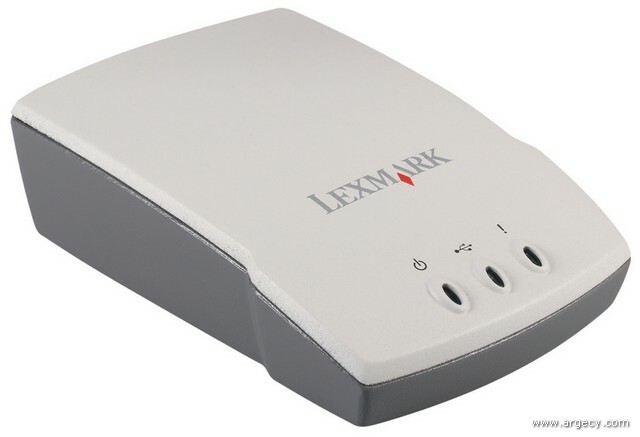 The Forms application requires the MFP be assigned to a Lexmark Document Portal Server v3.2. The Lexmark Document Portal is customizable print on demand software application that automates pull printing and distribution of documents from a central server. Two types of forms are supported: static forms such as brochures and auto-fill forms such as loan applications. Auto-fill forms require the user to enter input using the MFP touch screen keyboard. 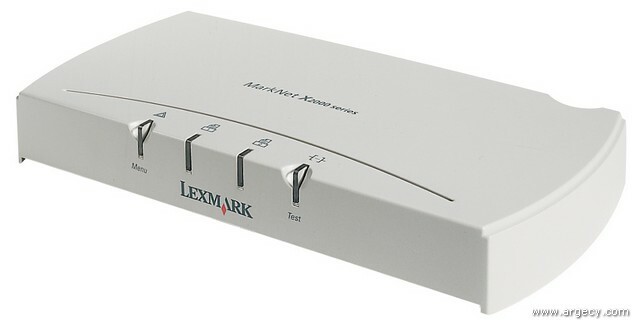 Lexmark Document Portal forms access can be secured by requiring user authentication. Copy Defaults: Set copy presentation, quality, finishing, output bin, etc. Fax/Fax Server Setup: Set station name/number, fax queue access, cover page, quality, redial, fax log, etc. Scan to Network General Setup: Set quality, file type, confirmation page, etc. Scan to E-mail General Setup: Set SMTP gateway, reply address, subject/message, etc. Configuration for Kerberos authentication and LDAP server parameters. Manage Destinations: Setup shortcuts for e-mail, fax and FTP, and delete profiles. Printer/Print Server: Access to printer Web page. Update MFP software: Allows updates to the MFP controller software. Create Scan Profiles: Utility to create permanent scan profiles. Used to recalibrate the touch screen if required. Presents the Administrator a list of reports for simple one-touch printing. Electronic Document Management Systems (EDMS) The Infoprint 1145 MFP is compatible with Kofax Ascent Capture version 5, Ricochet Capture, and Ricochet Coversheet products. The scan-to-network capability of the MFP can be used to instantly scan documents over the network to Kofax Ricochet Capture or Ricochet Coversheet products. Ascent Capture can recognize, index, quality assure, and release documents into many EDMS applications. Adobe, Altris Software, A.I.S., Anite Public Sector, asOne, CyLex, Documentum, DocuWARE, Eastman, Excalibur, Fabasoft, FileNET, Full Circle, Gauss Interprise, Hershey Technologies, Hummingbird, Hyland Software, IBM, icomXpress, IMR, InterTech, Kainos, LaserFiche, LizardTech, MDY Advanced Tech, Mobius, Open Text, Optika, OTG, Quest, SolCom, Systemware. 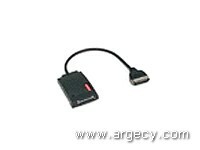 A 1.2 meter RJ-45 cable is supplied with the Infoprint 1145 MFP to connect the scanner control unit to the printer. The RJ-45 cable to connect the scanner control unit to the Ethernet wall outlet is the customer's responsibility. 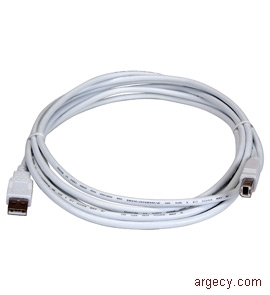 A 2.1 meter RJ-11 cable is supplied to connect the scanner control unit the telephone outlet. Note: The software applications that operate with most Apple LaserWriter printers will generally operate with Infoprint 1145 MFP. Drivers for Windows 3.1x, Windows NT 3.51 and OS/2 are available from the IBM Web site. Note: The Windows software applications which operate in the operating systems listed above are best suited to run with the drivers supplied with the Infoprint 1145 MFP printer. These drivers take advantage of your printer functions and increase the printer performance wherever possible. A Microsoft certified system driver will be available from the IBM Web site by January, 2005. IBM AS/400 Systems with TCP/IP with OS/400 V3R1 or later using OS/400 Host Print Transform. The standard Ethernet print server also supports a resident Web page with Microsoft Internet Explorer 4.0 or later and Netscape Navigator 4.5 or later for Windows 95, Windows 98, Windows Me, Windows 2000, Windows XP or Windows NT. NPRU will not support the Infoprint 1145 MFP. This utility will not support the Infoprint 1145 MFP. 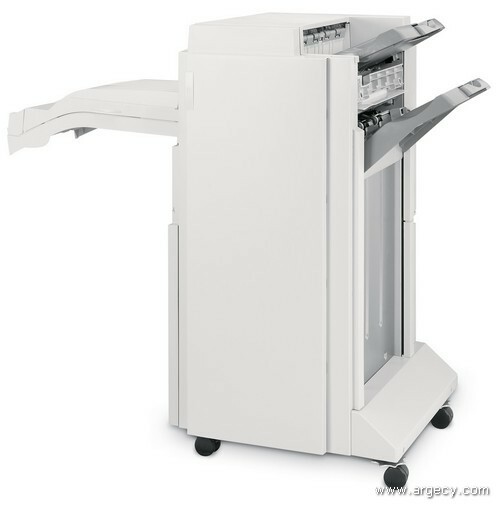 The Infoprint 1145 MFP optional Finisher has two output bins with bin full and empty sensing and supports stapling, hole punch and offset stacking. The Finisher is customer setup and attaches to the right side of the printer. The High Capacity Feeder or Printer Stand must be installed prior to installing the Finisher. There are two orderable part numbers, 3K Finisher 3-hole punch and 3K Finisher 4-hole punch. Power is supplied from the printer power supply so no external power source is required. Total output capacity is 3,250 sheets: Bin 1 is 250 sheets and Bin 2 is 3,000 sheets (20lb/75g/m2, A4/Letter, plain paper). The Infoprint 1145 MFP optional Envelope Feeder is customer setup and attaches to the left side of the printer, replacing the auxiliary tray. The Infoprint 1145 MFP has three slots for memory and flash features. Only one flash feature is allowed. If more than one flash feature is installed, the feature with the largest capacity is used. If a flash feature and an Optra Forms flash feature are both installed, the Optra Forms flash feature is used. If larger storage is required, an optional hard disk feature is also available. The hard disk with adapter plugs into one of the 2 connection slots. Multiple hard disk features may be ordered although only one hard disk can be installed at a time. The following font DIMM features plug into the memory slots. This DIMM contains two scalable fonts for use in PostScript emulation. 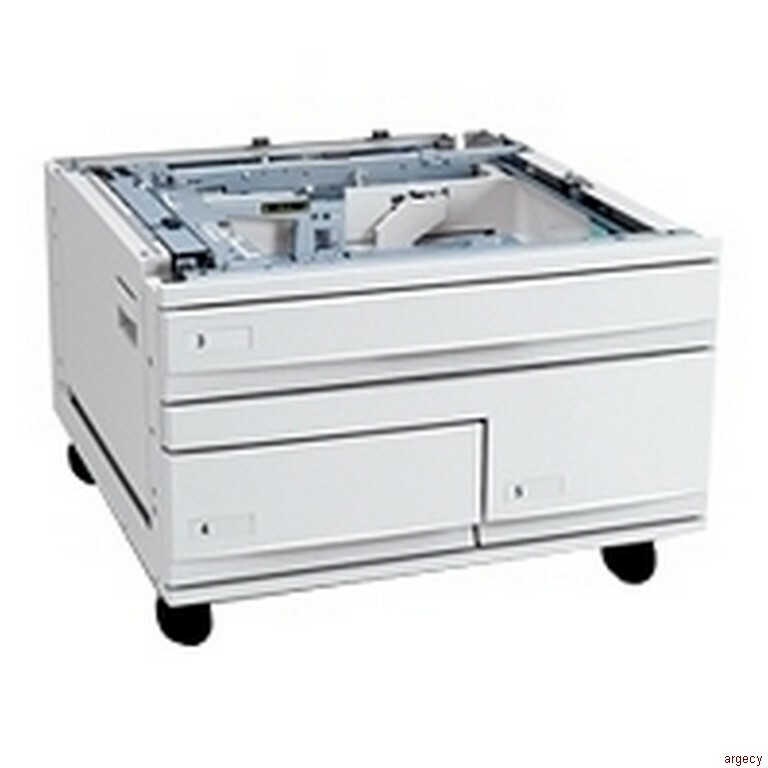 In addition to the standard USB port the Infoprint 1145 MFP has two expansion slots that can be used for an optional hard disk, optional internal print servers, or optional local connections. Microcode updates are available from the IBM web site atwww.ibm.com/printers. These extenal Print Server features allow the printer to be connected to a network using the printer's parallel or serial port. These features are only available for the base printer models. Each printer using Optra Forms must have an Optra Forms flash installed. The Optra Forms Software may be installed on a server so each printer does not need its own copy installed. Optra Forms is supported by the Infoprint 1145 MFP using the Optra Forms 16 MB and 32 MB Flash DIMM's. Optra Forms is supported on the Infoprint 1145 MFP using a Optra Forms flash. These features plug into the flash memory card slot. The ImageQuick card is standard and already plugged into this slot for the Infoprint 1145 MFP. To use another application solution feature, the ImageQuick card must be un-installed. The Bar Code Option Card enables the Infoprint 1145 MFP to print a wide variety (over 47) of the most popular industry standard bar codes. The Bar Code card primarily generates bar codes algorithmically. The Bar Code Option Card emulates HP printers with an HP Barcodes&More Cartridge/ SIMM/DIMM or a JetCAPS (BarSIMM(/BarDIMM( (v.2.0b) installed for compatibility with existing bar code applications using HP/JetCAPS solutions. This feature is installed in the applications solutions slots. Detailed information on this feature is provided below. This feature is installed in the optional firmware slot. For IPDS emulation, the card supports resident scalable fonts and 300, 600, 1200 image quality or 1200 dpi (except Infoprint 1145 MFP) print resolutions. The resolution is selected through an IPDS MENU setting. This setting determines the print resolution of IPDS text, graphics, bar code, scalable image and scalable font data.